Blueprints is a game that I had been anticipating for almost a year now. I had heard some very promising tidbits from my new found Canadian friends at the Gathering of Friends back in April, and they were all very high on the game. In Blueprints, players draft dice from an ever changing supply to construct buildings. 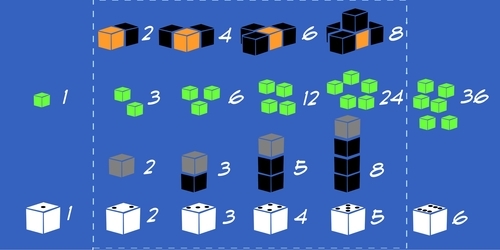 The main components in the game are 32 d6, 8 each in clear, orange, green and black. These are mixed up in a bag. A supply is created on the table by randomly drawing out some of these dice (the number changes based on the number of players in the game) and rolling them. It may help you to organize the dice by number. At the start of the round, each player is dealt a Blueprint card. This card shows the played his “ideal” building for the round. The building is always comprised of 6 dice. There is a 2×3 grid on this card which shows you the allowable footprint for building during that round. This Blueprint card is kept secret – hidden from other players behind your player screen. Two dice are also drawn at random to be put on the tiebreaker spaces on the score track; these must be of different color. On your turn, you choose one of the dice from the supply area and then add it to your Blueprint card. Rules for placement are simple. A new die must be placed either on: 1) an empty space in the buildable footprint OR 2) on top of an already placed die of equal or lower value. In the unlikely event that you cannot place your chosen die, it is discarded. You are on your honor to place correctly because all the building activity is hidden behind your screen. After you place your die, you replenish the supply on the table by drawing a die out of the bag and rolling it. Play continues until all players have had a chance to draft and place six dice on their blueprint. At the end of the round, you evaluate each player’s building. Each different color of die scores differently, and it is easiest to go color by color — There is a score board which you can use to track the scores as you go. After all of the dice have been scored, award a bonus 6 points to each player that has built his building according to the exact specifications shown on the blueprint card. Now it’s time to hand out awards. The player who has the most valuable building gets a gold medal worth 3VP. Second place = 2VP silver medal. Third place = 1VP bronze medal. If there is a tie, the tie is broken by the player that has used the most dice of the 1st tiebreaker color (remember that 2 dice were drawn at the start of the round). If there is still a tie, go to the 2nd tiebreaker color. After the awards are handed out, there there are four special prizes available. All players are eligible to win these awards, and a player can win multiple awards in the same round if his building qualifies for multiple prizes. Each of the prizes is worth 2VP. Ties are broken using the tiebreaker colors on the scoring track. If no one qualifies for a particular prize, it simply isn’t awarded. After the prizes are scored, the round ends. All the dice are returned to the bag, players get a new Blueprint card, and building occurs again. The new starting player is the player whose building had the least value in the previous round. The game only goes for three rounds, and there is no end-game bonus scoring. Simply total all the points up on your awards and prizes, and whoever has the most VPs wins! Ties are broken by the player with the most prizes. I have truly enjoyed my experience thus far with Blueprints – there is a lot going on in a short 20-30 minute game. Most of our games have been close affairs, though I think this is due in large part of the very granular scoring system. Winning scores are often in the 9 to 12 point range, so you can see that every point can make a difference. It seems that I spend the most time each round trying to figure out how I want to approach the particular blueprint – do I want to try to keep to the plan and score the 6 bonus points OR do I want to eschew the blueprint and go for prizes. At the start of the round, you see between 7 and 9 dice, so you have a decent idea of what numbers and colors may be available to you. Of course, all your opponents get to choose dice in between your turns! You can even start on a path and then alter it mid-round based on how the dice are going (and what you have seen your opponents collect). Though this takes a bit of thinking to plan your turn, most individual turns last under 30 seconds. You have plenty of time to survey the supply as the other players take their turns, and usually, you know what you are trying to accomplish. We have had some rounds where the placing of dice took less time than the scoring/VP awarding! I know that plenty of gamers have a strong dislike of hidden but otherwise trackable information – i.e. you generally don’t remember what people are collecting and building behind their screens – though you could write it down and keep track of it. I don’t mind this sort of mechanic, and in fact, I think the semi-perfect knowledge that exists by the end of the round helps keep things exciting and interesting. There’s also a nice bit of tension at the end of each round as you often find yourself silently hoping that the one die you need isn’t taken by other players or that someone else rolls the number that you need when they are adding a die to the supply. The other element of this game (and most every other dice game) which can be polarizing is the amount that luck can sway the results. Simply stated, if the player who goes just before you continually rolls numbers and colors that you need, you’ll do well in the game. And I’ve seen games where a particular player got the exact color/number he needed on the last turn of each of the three rounds. From my standpoint, no biggie – it’s a 20-30 minute game and it’s a dice game, after all. This has turned into my post-Essen go-to starter/filler/closer as I think there is a lot of game here for your time invested. It has also gone over well with the kids, and it provides a nice break from homework in the evenings without completely derailing the schedule. Dan Blum: I like the building part of the game. However, I find the scoring to be too sharp; it is possible to construct a building which qualifies for several prizes and lose out on all of them to buildings with one more tiebreaker die. This gives an air of futility to the building process. In a game of this length I think most people are OK with getting hurt by randomness occasionally, but this somehow feels different, possibly because you have to work for your zero-point building. Joe Huber (one play): Dan summarized most of my issue with the game; the only other concern is the lack of control over what choices you have available, which can be frustrating – and leave the feel of having insufficient control. As a result, it felt to me like a game that _could_ have been really enjoyable for me, but instead was just – OK.
Mitchell Thomashow (one play). Very clever to use dice as building material. Game entails some probability assessment, memory, and bluffing. It’s entertaining, amusing, and thinky, but also light. The dice rolls can ruin the best laid plans. For some that’s frustrating, for others its fun. 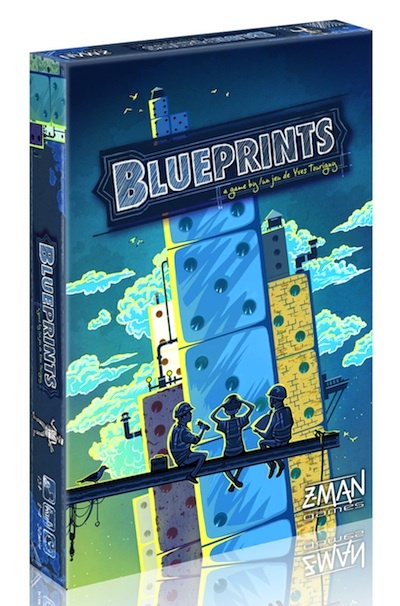 Blueprint is an imaginative way to use dice and deserves credit for that. This entry was posted in Essen 2013, Reviews. Bookmark the permalink. I was not aware of Brad Nordengs’ game, but from the rules I can see the similarities. It seems likely that we were both inspired by the theme to think along the same lines. I think his game would be more appealing if it used dice rather than the Nestortiles. It seems a shame to remove that third dimension, but I understand that it was made with those tiles in mind.